You’ve probably heard airlines “cracked down” on emotional support animals (ESAs) making it harder for folks to travel with their loving companions. Gazing into the eyes of your dog increases your oxytocin, a hormone responsible for feelings of love and connectedness, and decreases your stress (Nagasawa et al., 2015 in Science). Upon reunion with your dog, your heart rates synchronize and lower (Research from Monash University). Dog owners are more likely to be alive 1 year after a heart attack than those without dogs, a finding independent of initial heart attack severity and other relevant psychosocial factors (Friedmann et al., 1995 in the American Journal of Cardiology). Cats and dogs control their owner’s blood pressure more effectively than medication in stressful situations (Research presented at the annual meeting of the American Heart Association, 1999). Elderly folks report feeling less lonely after spending time with a dog compared to spending time with other humans (Banks & Banks, 2005 in Anthrozoos). Pet owners (yep, including those with cats) demonstrate lower stress reactivity during challenging situations when their pet is present as opposed to when their partner or spouse is present (Allen et al., 2002 in Psychosomatic Medicine)! In a sample of adults with HIV, those with dogs were 3 times less likely to suffer from depression (Muldoon et al., 2017 in JMIR Mental Health). In those suffering from depression and on antidepressant medication, dog owners report a significant reduction in their symptoms and higher rates of remission compared to those without dogs (Mota Pereira et al., 2018 in the Journal of Psychiatric Research). Finally, I believe there are hundreds of additional studies supporting the physical, mental, emotional, and social benefits of pet ownership in individuals across the lifespan with a variety of conditions. 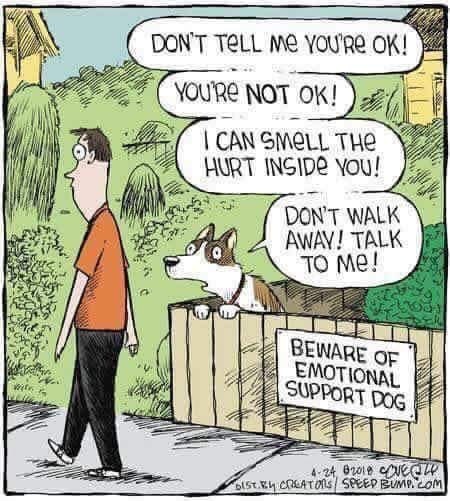 If you want my honest to goodness opinion, if we were more pet friendly as a culture, the term emotional support animal would have never been created. If we really understood the benefits animals provide us and that so many struggle with things we will never know about or understand, we’d celebrate the human-animal bond, not restrict, limit, or challenge it. But, we don’t. We don’t really understand that bond or how it serves us. So, for those whose daily lives are impacted by trauma, anxiety, depression, chronic illness, and so on, I, with a portfolio of research backing me up, champion emotional support animals and their humans. Have a question? Got a topic you’d like to learn more about? Email me and you might just see your interest addressed in a future blog post!